Before adjusting your seat, please read and observe the warnings ⇒ . – Press switch B, fig. 76 forwards or backwards. 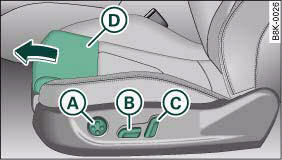 – Slide the seat cushion back to the normal position after each use.